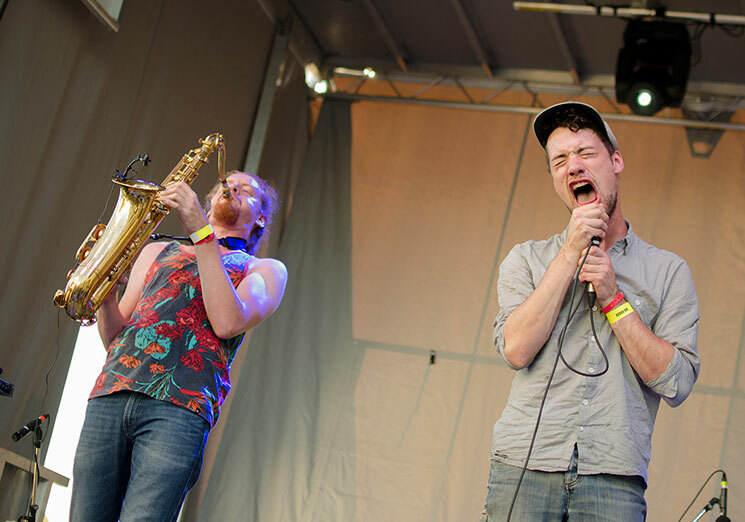 Sharing a wind player and a drummer with fellow Montreal outfit Year of Glad, Ottawa got a taste of two acts in one when Saxsyndrum took the stage early Saturday evening on Albert Island. A performance that was much more than a simple genre crossover, the powerful set was controlled by Dave Switchenko's thick tenor saxophone tones and Nick Schofield's drumming — whaling away on his small kit with a force the festival hadn't seen up to then. Rather than simply soloing over drum patterns and electronics, Switchenko's sax playing style became a point of interest with his use of effects pedals, allowing him to use everything from proper notes to the instrument's occasional squeak to his advantage. Short bursts of melody drowned in reverb added soft musical texture, which he then modulated with a small synthesizer while Schofield pounded the drums. Also controlling a trigger pad from behind the kit, he simultaneously incorporated a variety of pre-programmed beats ranging from slow and atmospheric to garage-like. Alexandre Bergeron's frantic vocals rounded out the performance, which he sang in head voice almost exclusively. Using no discernible lyrics, he would push his vocal register until it could go no higher, slumping back in his chair in cathartic fashion each time.